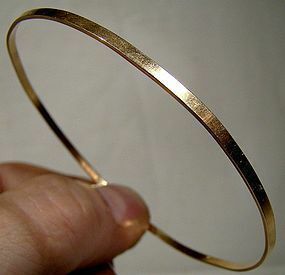 A simple classic vintage 10k yellow gold Birks bangle bracelet. 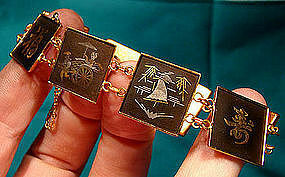 This bracelet measures 2-5/8" across the interior, it is just over 1/16" wide and it weighs 4.0 grams. It is stamped 10K with the B in a hexagon Birks mark, and it is in very good vintage condition with no breaks, corrosion, losses, or repairs other than some minor undulations around the edge from being worn. All items are thoroughly and conservatively graded and all condition issues are noted; all items are vintage or antique and may have slight signs of gentle use. Expedited tracked parcel shipping to the U.S. starts at $21 (other spots may vary, xpresspost is higher) - tracking and insurance are included in shipping quotes. Items paid with a credit card will be shipped to confirmed addresses only. We do ship internationally. All of our prices are in $US. PLEASE NOTE: we DO NOT accept PayPal, only VISA and MASTERCARD. 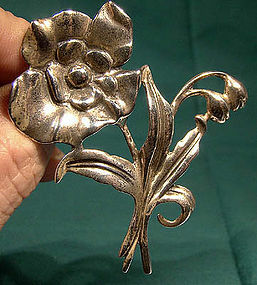 A vintage c1920s Scandinavian .830 silver 2-5/8 x 3/4" bar pin by Hugo Grun of Copenhagen, Denmark. In business from c1918-1937, this signed pin has Grun's H.Gr 830S mark on the c-clasp guard, it weighs 5.4 grams, and it is in excellent condition with no dents, bends, corrosion, losses, damage or repairs. 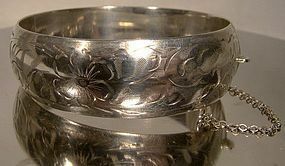 All items are thoroughly and conservatively graded and all condition issues are noted; all items are vintage or antique and may have slight signs of gentle use. Surface shipping to the U.S. starts at $6.90 (other spots may vary) - insurance is included. Items paid with a credit card will be shipped to confirmed addresses only. We do ship internationally. All of our prices are in $US. PLEASE NOTE: we DO NOT accept PayPal, only VISA and MASTERCARD. 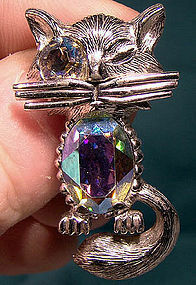 A rare Gustave Sherman winking cat figural brooch pin from the 1950s. This pin has two blue aurora borealis stones; this signed 1-1/2" x 7/8" comical feline pin features a safety catch and it is signed Sherman in script on the back. This item is in very good vintage condition with no chips, cracks, dents, bends, corrosion, losses, damage or repairs other than a tiny bit of foil loss to the extreme tip of the large aurora stone. All items are thoroughly and conservatively graded and all condition issues are noted; all items are vintage or antique and may have slight signs of gentle use. Expedited tracked and insured parcel shipping to the U.S. starts at $22 (other spots may vary, air is higher). Items paid with a credit card will be shipped to confirmed addresses only. We do ship internationally. All of our prices are in $US. PLEASE NOTE: We DO NOT accept PayPal. 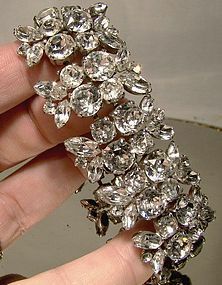 A vintage 16-1/2" signed BOGOFF rhinestone necklace c1940s-50s. 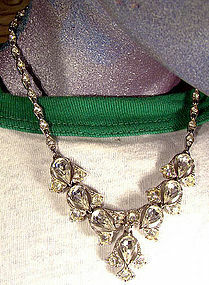 This necklace has a lavaliere-style drop with teardrop and round claw-set rhinestones, and it has a hook clasp. 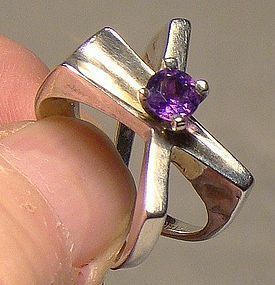 This item is in excellent condition with no chips, cracks, dents, bends, corrosion, losses, damage or repairs other than some minor yellowing to some of the stones. All items are thoroughly and conservatively graded and all condition issues are noted; all items are vintage or antique and may have slight signs of gentle use. Surface insured shipping to the U.S. starts at $6.75 (other spots may vary) - insured is higher, and mandatory on items over $95 if paid with a credit card. Items paid with a credit card will be shipped to confirmed addresses only. We do ship internationally. All of our prices are in $US. NOTE: we DO NOT accept PayPal, only VISA and MASTERCARD. A vintage pair of signed Christian Dior gold plated 1968 striped agate glass clip-on earrings. These 7/8 x 5/8" earrings feature bezel-set rectangular rootbeer coloured glass stones resembling banded agates; they also have a bit of movement similar to tigereyes. This pair is in excellent condition with no cracks, dents, bends, corrosion, losses, damage or repairs other than a tiny flake on the middle of one glass stone (barely visible, and exaggerated under our halogens). All items are thoroughly and conservatively graded and all condition issues are noted; all items are vintage or antique and may have slight signs of gentle use. Tracked packet air insured to anywhere in the US is $4 (other spots may vary). Items paid with a credit card will be shipped to confirmed addresses only. We do ship internationally. All of our prices are in $US. PLEASE NOTE: we DO NOT accept PayPal, only VISA and MASTERCARD. 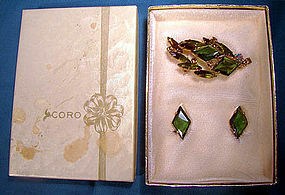 A signed B. David green blue rhinestone pin & earrings set probably from the 1960s. 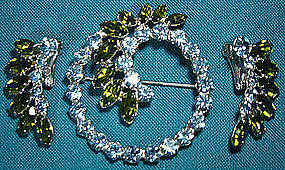 This nice quality vintage rhinestone 1-3/4" x 1-1/2" pin and 1" x 7/8" clip-on earrings set features claw-set light blue and peridot green coloured rhinestones and each is signed B. DAVID (in business 1945-93). This set is in excellent original condition with no chips, cracks, dents, bends, corrosion, losses, damage or repairs. All items are thoroughly and conservatively graded and all condition issues are noted; all items are vintage or antique and may have slight signs of gentle use. Tracked Packet shipping to anywhere in the U.S. is $14.00 - this includes online tracking, air service and insurance up to $70. Items paid with a credit card will be shipped to confirmed addresses only. We do ship internationally. All of our prices are in $US. PLEASE NOTE: We DO NOT accept PayPal. 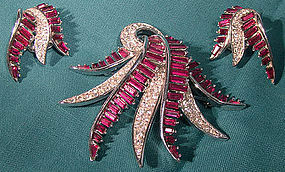 A well-made blue and green claw-set rhinestones brooch and earrings set circa 1950s. It looks like a Delizza & Elster set, but has not been verified. 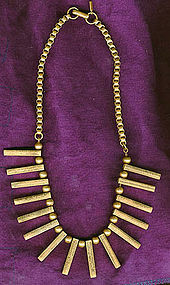 This set includes the 2" x 1-5/8" brooch with safety catch plus the 1" x 3/4" clip-on earrings. 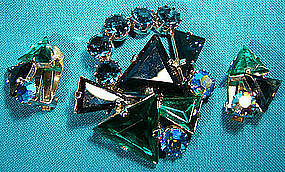 Each has deep royal blue and emerald green triangular rhinestones as well as round blue and blue aurora borealis stones. 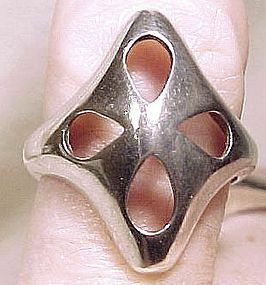 It is in excellent vintage condition with no chips, cracks, dents, bends, corrosion, losses, damage or repairs. 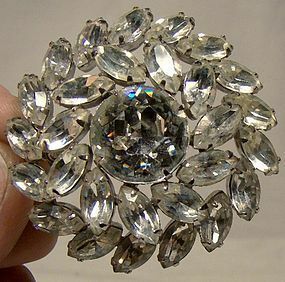 All items are thoroughly and conservatively graded and all condition issues are noted; all items are vintage or antique and may have slight signs of gentle use. Small packet surface shipping to the U.S. is $6.95 (other spots may vary) - insurance to $100 is included. Items paid with a credit card will be shipped to confirmed addresses only. We do ship internationally. All of our prices are in $US. PLEASE NOTE: we DO NOT accept PayPal.